Just as resounding as the grandeur and beauty of the Blue Ridge Mountains, the Roanoke Valley offers an abundance of fresh-air adventures for all types of outdoor enthusiasts - even the most devout four-legged fanatics. With an array of greenways, parks, trails and special events, the Roanoke Valley is a premiere pet-friendly destination for all visitors. 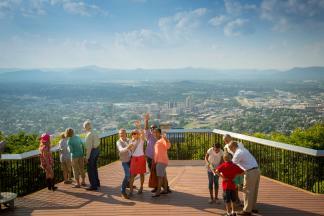 Let the journey begin at the Roanoke Star & Overlook, located on Mill Mountain, one of 60 parks complete with a trail system and a host of outdoor recreation. Roanoke City also offers a Dog Park, where dogs of all sizes can romp and roam off leash within the special area, which is part of the larger Highland Park. Open since 2009, the site allows owners to bring up to two dogs at a time from 6pm - 11pm, and includes convenient Mutt Mitt stations for immediate clean up and disposal of pet waste, and plenty of open space for the most rambunctious dogs to run about. The valley&apos;s more than 22 miles of greenways allow domestic pets that are leashed and with their owners for a walk, run, picnic, biking or to simple watch nature in a peaceful setting. The Roanoke River Greenway, Lick Run Greenway, Mill Mountain Greenway, Murray Run Greenway and Tinker Creek Greenway serve as scenic connectors linking Roanoke&apos;s natural charm to its alluring neighborhoods and radiant downtown. Not far from the center of town is Carvins Cove Natural Reserve, the second largest municipal park in the nation and boasts a major water source within its 12,700 acres and plenty of hiking and equestrian trails. Continue your outdoor exploration along the Blue Ridge Parkway and Appalachian Trail, which welcome furry family members for hikes, camping and all around fun along their picturesque trails. Dogs must be leashed along the Parkway (Click here for Blue Ridge Parkway regulations) as well as the Appalachian Trail for safety and courtesy to others. (Click here for Appalachian Trail regulations). Of course, owners are responsible for cleaning up after their pets. When you&apos;re ready for a change of pace, venture to downtown Roanoke and discover the lure of the Historic City Market, which boasts a storied tradition and thrives as the pulse of the Roanoke Valley. Open year-round, pets are allowed to walk along the market if leashed and picked-up after. Some retailers like Walkabout Outfitter and Orvis sell pet merchandise, while others may place a welcome water dish for pets outside their doors on warm days. When you find yourself hungry for some homemade fare, stop by any of the local eateries for a great meal. And although you will likely find plenty of fare to satisfy your appetite, PawPaw&apos;s, which typically occupies a market stall, sells savory home-made dog treats even the most curious canines are sure to love. Shopping takes on an entire new meaning at Black Dog Salvage, located just minutes from downtown Roanoke in the Historic Grandin Village. Be sure to greet Sally the Salvage Dog as you browse through 40,000 square feet of architectural antiques, commercial salvage and an assortment of other one-of-a-kind finds. Dog lovers can continue the theme while indulging in the serene surrounding at Chateau Morrisette Winery, just off the Blue Ridge Parkway in Floyd County. Tour the grounds, taste their most flavored blends and savor cuisine from the American South, all while captured by the absorbing views of the Blue Ridge Mountains. Each year, the winery hosts such events as the Black Dog Wine and Music Festivals, held on select weekends throughout the summer and early fall. Enjoy more Virginia wines, with your favorite four-legged friend in tow, at the annual Horse and Hound Wine Festival held in July at Johnson&apos;s Orchards in Bedford County. Take a horseback ride through the orchards&apos; rolling hills, test the agility of your pet in the dog and muskrat races, shop the many arts, crafts and food vendors, or grab a spot for you and your pooch under a tent as you sip fine wine and sway to the live music. If you&apos;re looking for a more dog specific affair, spend time in the summer sun at the annual Woofstock event in June at Elmwood Park in downtown Roanoke or choose the cooler fall weather at Dogtober Fest held in October at the Saint Frances Training Center in Roanoke. The event boasts the Parade of Dogs and other activities for dogs and kids, including the PawCasso Paw Painting, the Doggone Good Diner, an obstacle course, a mechanical surfer, music and more. When it&apos;s time to wind down, choose from a variety of pet friendly hotel/motel properties in the Roanoke Valley to book a room for you and your beloved pet. Some allow you to bring up to two pets for an additional fee, while some feature designated pet areas on their grounds. At Sheraton Roanoke Hotel and Conference Center, be sure to ask for the Sheraton Sweet Sleeper Dog Bed for your tired tail-wagger. Come discover what makes the Roanoke Valley prime for pet lovers. For more information about Virginia&apos;s Blue Ridge, visit our website/mobile site at www.visitroanokeva.com, call (800) 635-5535 or stop by the Roanoke Valley Visitor Information Center located in Downtown Roanoke. Open 9am - 5pm daily.